Green Bridges > blog > Why would they listen to us, when we don’t even listen to ourselves? And we mess things up so badly, that we make the original problem worse. A systems archetype of ‘fixes that backfire’. This blog is only about the first of those pairs: emotions and facts. I used my systemic perception to discern a pattern that I see happening, which is counterproductive to inviting people to open up to the facts about climate change. What we – who care about climate change – tend to see when we look at society, is a bunch of leaders who consciously speak to people’s fear and promise measures which are contrary to doing what is necessary to reduce the magnitude of climate change, let alone mitigate for its effects. We also see a lot of people who vote with their guts. People who don’t seem to care about facts and who follow their emotions. When we take a wider scope we see a whole society hypnotized by advertisers, who play to our emotions, making us want to consume in anticipation of something that might go wrong, or as a means to enlarge our status or our sense of freedom. We’ve become the plaything of those who want to manipulate us into buying. Not strange that some of us, who’ve let the facts sink in, are fearful of the role that emotions play in society at the moment. And yet, I’ve come to the conclusion that we should look at ourselves and at the concept of emotions, in order to understand why nobody’s listening to us. 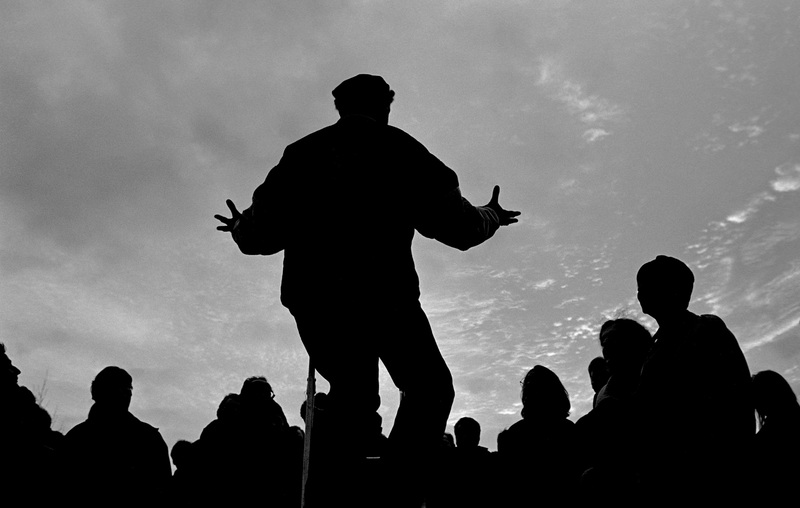 Better still: to understand how we might get our voice back and be heard, while speaking from the heart. What I’ve learned about this subject is primarily through self-discovery. The last few years I’ve engaged in deep self-work, introspection, journaling, workshops and looking at my own reality as a mirror for what’s going on inside. One of the things I discovered in the process is that my cognition works over hours in general, but even more so when I’m feeling trapped or stressed. If I think I’m losing control in a project, I have the tendency to start analyzing, and advocate my point of view with facts. I let my thinking take over. This gives me a great sense of control again. At the same time, when I hear myself talking when I’m in such a cognitive mode, saying the same thing over and over again in different words, I can see my conversation partner go more and more quiet and slowly withdraw, or become more defensive. Not very effective. I realize this very well. Recognizing this survival pattern in myself, has made me aware of a more general pattern in society, to speak to the facts more loudly, more boldly and more convincingly, the more we feel stressed and about to lose control. That this doesn’t work and even deteriorates the original problem, is obvious when you bring that same dynamic back to your own experience. Think about your children – what happens if you introduce facts when they’re upset? If he’d introduce facts whenever his child is really upset, telling his child it doesn’t need to be so upset, would make his child even more upset. Or, and that’s also a serious option, he would see his child go quiet and suppress its emotions. It would conclude that apparently those emotions are not okay. So what does work in the case your child is upset? My neighbor says: ‘I’d connect with my child, acknowledge its emotions, sincerely listen, and ask what my child might need. Maybe then, when the emotions wither down, I come up with suggestions to change the situation: shall we go outside and look at the birds? Do you feel like we grab your teddy bear and have him give us a hug? After I do all this, my son is relaxed and open to questions and new ideas’. As a child calms downs and the emotions wither down, the child becomes open to listen to you. By providing suggestions, the child becomes positively engaged, and reestablishes a connection with its own self; it connects with its deeper needs. At the international Club of Rome meeting, where people kept talking about the question why so few people would listen to the facts of climate change, and about their fear for a fact-free society, I drew the following systems diagram to explain the dynamics that I see occurring in the whole of our society, when it comes to emotions and facts. Systems diagram ‘fixes that backfire’ – this diagram contains two loops. One balancing loop (B) and two reinforcing loops (R). The upper balancing loop consists of the problem and an answer to the problem as a response. In the short term this answer seems to help solve the original problem. 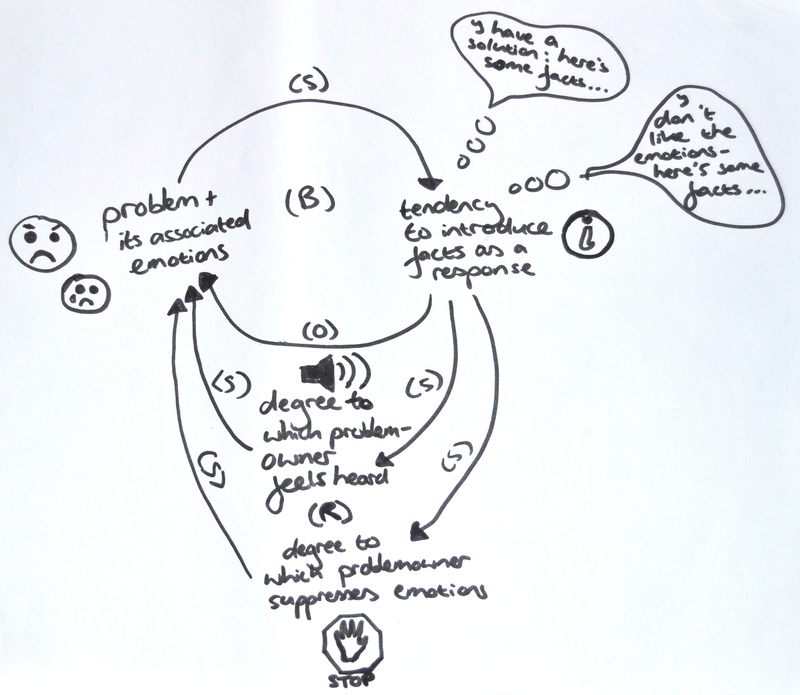 The lower reinforcing loop shows that the consequence of the fix that is chosen, reinforces the original problem in two ways: after introducing the facts, the problem owner feels even less heard and will get the feeling that the original problem is worse. Secondly, the problem owner will tend to suppress his or her emotions, which will also make the original problem worse. When the problem is worse, the tendency to introduce even more facts exists, hence the reinforcing dynamic. Legenda: S= same – when one variable changes, the other variable changes in the same direction (both up, or both down). O= opposite – when one variable changes, the other variable changes in the opposite direction (one up, the other down). Fixes that backfire – in your face! What you see here is the following. The bigger or more serious the problem and its associated emotions, the larger our tendency to introduce facts to either solve the problem, diminish the problem or explain that the problem is not seen correctly. Maybe we even introduce facts to explain there isn’t a problem. Or, we introduce facts that show that what the other is experiencing as a problem, is nothing compared to the real problem (climate change/ the state of the world?). As a consequence of this tendency to introduce facts, the problem and its associated emotions seem to diminish. People suppress their emotions. Those who brought in the facts, might even for a moment feel like they solved the problem with the introduction of the facts. However, when you hang on there, and enlarge your time scope, you’ll see that another effect occurs. An unintended consequence of the introduction of more and more facts as a response to a problem and its associated emotions, is that the person experiencing the problem, will feel less and less heard. And as a person feels less and less heard, in the perception of the problem owner, the problem deteriorates and its associated emotions increase. Also; the more facts as a response to emotions, the larger the chance that emotions will be suppressed. Causing energy to get stuck, which is similar to experiencing a small trauma, which is nothing more than stuck energy, decreasing the amount of energy we have to engage in positive action. The more the original problem deteriorates, the larger the tendency again, to introduce facts, hence the reinforcing effect. This is a typical example of ‘fixes that backfire’, a well-known systems-archetype that shows that well-intended actions can have unintended consequences, that make the original problem worse. The whole dynamic is beautifully, and funnily illustrated in the 2-minute film: ‘it’s not about the nail’. Of course, there’s a nail in the forehead of the girl in this movie, but that’s not what it’s about. The girl is emotional and wants acknowledgment of her emotions. A factual conclusion that the nail can be removed, seems logical, but will deteriorate the situation; she will feel less heard, and will feel more upset. As a side note: The only problem I have with this movie is that it seems to point to the fact that mostly women act like this, while I know for a fact, that the same dynamic holds just as well for men. Intuitive responses get lost – why? Now, how come we intuitively know that if our loved ones are scared, angry or sad*, we shouldn’t present them the facts, yet we forget this logic in any other setting? Whether it comes to the organizations that we’re part of, or society in general; we hardly ever respond with the same intelligence that we obviously have, and use in our most intimate settings. This puzzles me. I’ve been thinking and reading about this a lot and I’ve come to a few key observations when it comes to our society as a whole. We no longer tend to see emotions for what they are; as a signaling mechanism. Worse: we look down upon emotions. Emotions are dangerous. That’s the first thing I learned working in the energy sector. The internal slogan of one of the companies I worked for to reorganize their energy transition program was ‘Let’s move from emotion to ratio’. The strong conviction was that the energy transition would never succeed if people wouldn’t learn about the facts. And emotions were to blame for all ‘unwise (read: stupid! )’ decisions. The same company kept wondering why ordinary citizen didn’t seem to care about the energy transition. Why weren’t people inclined to act? Why did people not feel involved? Speaking with them often, I believe they understood very well that for positive action, people need to trust that their actions matter, they need to be excited about the opportunities for change, they need to love the planet and their family and get positive energy or joy from taking action. All these positive feelings and underlying emotions, should be stronger than their fear. Or in other words: I think they knew that we need people to feel emotional about what’s happening to our planet, so that they will act whole-heartedly. Why then, while they obviously understood this, did they keep longing for an energy transition based on facts, far from emotions? When I let that sink in, one of the things that came up is how differently we look at different emotions. We value positive emotions, which we associate with self-control and taking responsibility. Yet we label many other emotions as bad, or dangerous. And in general, I notice the tendency to ‘deal with emotions’, to prevent that they bring chaos, rather than valuing emotions for what they are: a very strong signaling mechanism. Emotions help us regulate our own system, our body, but also our communities and society. Emotions signal a problem or confirm a positive state, and as such trigger action. In the Pixar film ‘Inside Out’ we are taught that the function of our dominant emotions ‘joy, sadness, anger, disgust and fear’, is to help us navigate our life. We need all these types of emotions to understand what’s going on with ourselves, and to determine what needs to be done. When in the film the character ‘sadness’ is not allowed to be there, since the protagonist, a little girl, doesn’t want to make her parents even more sad, trouble starts. She eventually becomes depressed, for sadness takes over control, even though she doesn’t want to. Now what do you think would happen if we only want ‘joy’ as an emotion and create a society where ‘sadness, anger, disgust and fear’ are not welcome? I think we only need to pick up the newspaper. We not only, not welcome sadness, anger, disgust and fear, but we don’t even seem to have any healthy societal mechanisms to deal with sadness, anger, disgust and fear. Other than soccer matches, hooligan fights or political arena’s where people can share their anger by taking it out on others or on specific causes. Some churches still play this role, but how many of us still actively go to a church? Even worse; when negative, or any strong emotion is expressed we tend to look down upon the person who shows the emotion, we tend to ignore the subject, or speak to the mind, and demand for a more neutral, cognitive response. Now again; how would your child react, if you wouldn’t allow its emotions to exist? What would be the long-term consequence? Worse than not valuing emotions for the signaling function they have, is that we pretend we don’t have any emotions and we actively suppress our emotions with our mind. Working with horses has made it clear to me, that this has a very scary consequence. Anyone who ever worked with horses knows that horses react instantly to what they sense. They need to determine whether you are a reliable part of the herd, and will sense what your position is in the herd; leader or follower. Both positions are fine, as long as is clear what you are. When it comes to determining whether we are reliable, the suppression of our emotions is very dangerous. Whenever you bring someone who is really afraid of horses, nearby a herd of horses, something interesting might happen. If a person feels fear yet suppresses that fear, as if pushing a giant emotional ball underneath the water surface, this will trigger huge unrest in the horses. The horses will start to run around, sniff the air and prepare for what might happen. They might even attack you, but more likely, they will try to flee. The physical incongruence that arose in the person that experienced the emotions of fear, yet used the mind to actively tell him or herself that those emotions didn’t exist, made this person highly untrustworthy for the horses. Another fearful person, that approaches the horses openly scared, acknowledging his or her fear, while just ‘being with the fear’, will have no effect on the horses. The morale: horses are fine with you being afraid of them. They’re far from fine with you suppressing, or even denying your emotions. This leads to energetic incongruence and that’s unreliable. Any horse in the herd needs to be able to trust your signals, so that the whole herd has more chance to survive. If you’re incongruent, you’re endangering the herd. Though we are no horses, I wouldn’t be surprised if the same reality holds for humans. Aren’t we too some kind of herd? In daily life we suppress our emotions all the time, unconsciously making us highly incongruent and unreliable in the eyes of our colleagues, or fellow members of society. My hypothesis is that especially those of us that know about the gruesome facts of climate change and have let that sink in, suppress their emotions about this all the time, with potentially disastrous consequences. What if our physiological incongruence makes us highly unreliable, to those who simply sense whether they can trust us, when we tell about climate change? I wouldn’t be surprised if it works like that. We humans are super sensitive when it comes to who we can trust. Quite recently, I’ve worked a lot with the writings of Joanna Macy, an environmental activist, scholar and writer, who also speaks about the general tendency to suppress our emotions, and the extreme consequences this can have. She speaks of the numbing of our mind and heart, when we suppress the emotions of fear, anger, sadness and confusion. When we are fearful, and the odds are running against us, it is easy to let the heart and mind go numb. Because the perils facing us are so pervasive, and yet often hard to see, this numbing touches us all. No one is unaffected by it. No one is immune to doubt, denial, or disbelief about the severity of our situation – and about our power to change it. Yet of all the dangers we face, from climate chaos to nuclear warfare, none is so great as the deadening of our response. The numbing of mind and heart is already upon us – in the diversions we create for ourselves as individuals and nations, in the fights we pick, the aims we pursue, the stuff we buy. Macy advocates that we should do anything in our power to open up to the pain we feel. Pain for the world is not only natural, it is a necessary component of our healing. Pain has a purpose: it is a warning signal, designed to trigger remedial action. It is not to be banished by injections of optimism or sermons on ‘positive thinking’. It is to be named and validated as a healthy, normal human response to the situation we find ourselves in. Thich Nhat Hanh: “What we most need to do is to hear within us the sounds of the Earth crying”. As a way to unleash the power of the emotions we suppress, Macy suggests truth-telling rituals in groups, where those present share the truth about their fear, anger, sorrow and confusion. These four emotions underlie the blanket of despair we feel when it comes to the state of our world, according to Macy. And all of theses emotions have a positive counter side. The other side of fear is trust. You will be angry when justice is at stake. We’re only sad for something we love. And in our confusion and not-knowing, room for renewal arises. When we go through these rituals, energy opens up to act from love, engage in action towards more justice, trust rises that a way forward exists and the room for renewal expands. The two times that I facilitated the truth-telling-ritual suggested by Macy, have been extremely powerful, and unleashed a lot of energy. Macy explains this as follows: Faced and experienced, its power [red: of the emotions] can be used. As the frozen defenses of the psyche thaw, new energies and intelligence are released. If it is true that we constantly suppress most of our difficult feelings and negative emotions, than we miss out on a lot of energy. Energy we need in order to step up and do what’s needed to redesign our societies so we may live in line with universal principles. Now let’s contemplate – is our problem really the fact-free society? How often have you not heard lately, that the problem of all problems is that we live in a fact-free society where emotions roam free? If only people would understand the facts and ‘wisen up’, we’d really get going when it comes to the societal change that is needed. I come to quite the opposite conclusion. Even though we’re faced with politicians that speak to our fears and advertisers that push our emotional buttons constantly, we also live in an age where emotions are looked down upon and actively suppressed. We, the so-called ‘reasonable, knowledgeable’ people, have forgotten how to deal with emotions and we tend to introduce facts as a response to emotions. Even though in intimate settings, we know that we should allow friends or family members to be with their emotions, rather than present them with the facts. When it comes to our children, we listen and acknowledge their emotion and by doing that, make sure their emotion are not suppressed. On a societal level and in organizations we do the opposite. We prefer that people don’t show their emotions and if they do we hint that a cognitive mode would be better. I believe that facts matter enormously, especially when it comes to understanding the severity of the situation and taking the right action, yet facts are very often introduced at the wrong moment and in the wrong way, especially by those of us who know the facts well and suppress the emotions those facts trigger. At the same time those emotions matter enormously, since they help us navigate our life, by providing very clear signals upon which we can act. When we wouldn’t suppress our negative emotions, yet would find ways to ventilate them, and be with them, what do you think would be possible? How much more energy would be available to act? How much more trustworthy and reliable could we (who know deeply about climate change) become in the eyes of those we speak with, if we would not actively hide and suppress our emotions. My call to all of us; let’s learn to acknowledge our own emotions, speak our emotional truth, and tap into the huge energy resources that come with the acknowledgment of our despair. Let’s not diminish the importance of facts, but choose the moments we introduce them much more wisely. **What’s also missing in our society is positive rituals; to give thanks, to acknowledge all that is and that what we love. A small film about the same question: why don’t people get the message about climate change? Ijzersterke blog! Ik ben het volledig met je eens. Dank voor deze uiteenzetting!